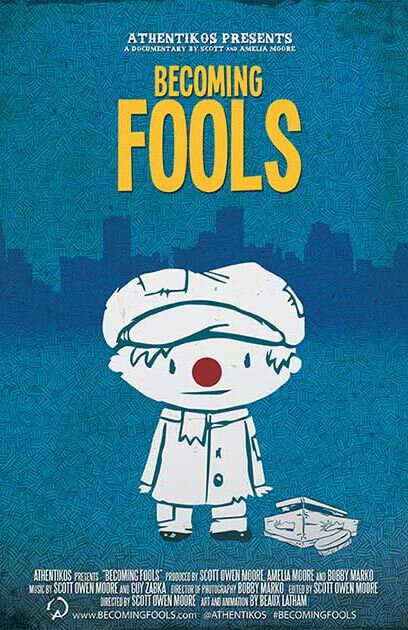 Becoming Fools was born during our production of Reparando. 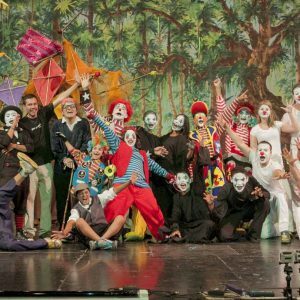 We fell in love with Italo Castro’s story: a professional clown who earned his living entertaining children at parties, but who also removed his makeup and cared for street children in his spare time. We interviewed and captured some footage of Italo in January 2009, and originally intended for his story to be woven into Reparando. But when we began editing the film, we decided that Italo needed his own story. In November 2010, we were in Guatemala for the premiere of Reparando, and spent some time with Italo to evaluate how best to tell his story. Italo took us to a place called “The Tank”, a dilapidated Pila to meet some “street kids”. We interviewed street youth and two things became very clear: first, that these youth had very tragic stories, and second, that they considered Italo a father figure. We returned to the US committed to producing a feature length documentary about Italo’s story called “Without A Costume” and began pre-production in December 2010. In February 2011, Italo drowned in a tragic accident that changed everything. Originally, we were going to focus the story on Italo, using symbolic imagery of clowning to tell the story of his passion. Ironically, we didn’t even interview Italo the last time we were together, because we already knew his story, and we were gathering research about the street youth. So, the only footage we had of Italo was what we captured during Reparando. We realized that we needed to tell a different story. In August 2011, we launched a Kickstarter Campaign that raised $110,000 in pledges, but failed to meet our $150,000 goal needed. So, as part of Kickstarter’s policy, none of those funds were activated. We had nothing … but we still felt called to share this story, so we asked our supporters if they would roll their pledges into our website so we could continue building momentum. We felt confident that we could raise the remaining funds needed to produce the film. As it turned out, only $50,000 of the original $110,000 in pledges were actually given to us … 1/3 of what we knew we needed. But we walked forward in faith, Becoming Fools to a calling (and incidentally, changing the film title to Becoming Fools). Italo was physically gone, but the legacy of his life continued to echo through the lives of the street youth. They wanted to honor their mentor, so we worked with them using our I Am Art Initiative to empower their dreams. In November 2011, we interviewed over 50 street youth, and people connected to the issue of street children: government workers, church ministries, and secular NGO’s. We scoured through the hours of footage and developed a script for a symbolic drama called, The Journey of a Clown, based on the legacy of Italo’s life and service to these street youth. In January 2012, we partnered with Freedom Guatemala and At Risk No More to produce the theatrical presentation in Guatemala City’s Teatro Abril, a renowned theatre with over a century of history. We gathered creative professionals to begin mentoring the street youth in weekly rehearsals. The dramatic troupe of street youth and creative professionals called themselves “Voz De Las Calles” (Voice of the Streets), and rehearsed together for five months in preparation for the event. We documented the entire process for Italo’s story, Becoming Fools. It has been a long road. There have been many times when we wanted to give up and questioned whether all our effort was worth it. But, this story is not over. We might never know the fullness of it’s fruit. Ultimately, it doesn’t matter. We didn’t set out to make a film that would bring us financial wealth. We fell in love with a “Holy Jester” and were inspired to join him in Becoming Fools.